A lot of gardeners like to go organic because it’s good for the environment, safe for beneficial insects and it’s also good for our health because we’re not eating pesticide residue. But what about inside the house? We’re still cleaning with toxic chemicals whose manufacturer’s instructions tell us to wear face masks and gloves. Some of these chemicals are so harsh that their smell is enough to make one feel sick. Not only that, the whole production process uses derivatives from oil or from mined sources. Let’s find out about what else you can use to clean your house. 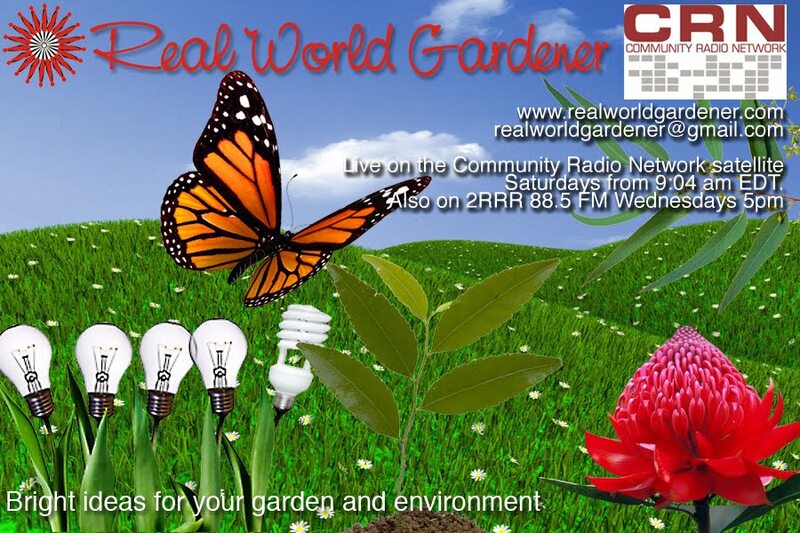 I'm talking with Margaret Mossakowska, President of Permaculture North. Switching to natural cleaning options is an important part of creating a natural home. Natural cleaning options can save time, money, and reduce chemical exposure. The best tip is bicarb soda and vinegar to clean most things. 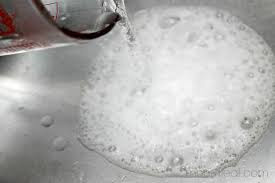 Vinerage is a mild bleach and can be used to clean the kitchen bench top, bathroom surfaces and even the toilet. 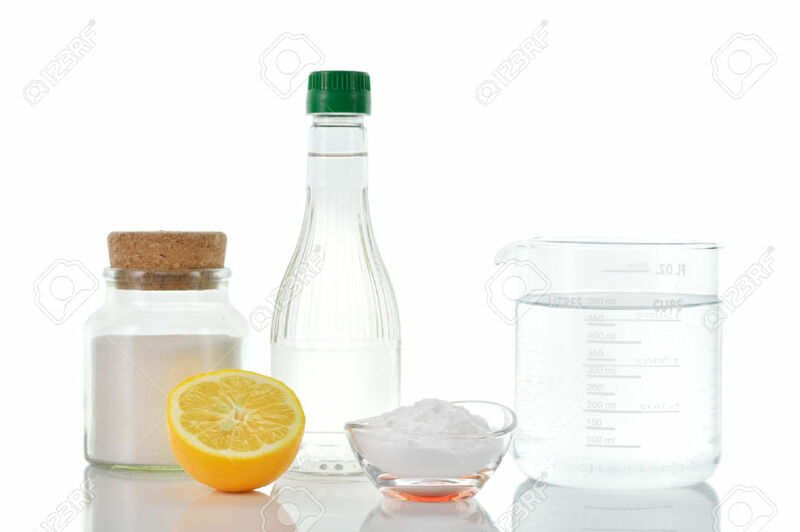 To clean your oven just mix a little water with bicarbonate of soda and place on the grease spots. Wait a few minutes, then spray with vinegar. This will foam up and lift off the grease. You can use normal white vinegar. There’s also citrus infused vinegar. All you do is fill a jar with (organic) citrus peels and pour undiluted white vinegar over them. Leave for a few days (up to 2 weeks) and strain out the vinegar to use as a natural cleaner. It works as a window cleaner (dilute with water), for mopping floors, or for disinfecting surfaces. Isn’t that what people used to do in the olden days? Funny how some things come around to again. Ever heard of the ugly duckling of the vegetable world? I could think of several but Celeriac or Apium graveolens var rapaceum has been described as the ugly duckling of vegetables, or just plain ugly. But if you don’t think of vegetables as pretty or ugly, don’t be put off by all that talk because it’s pretty useful to have in your garden. Celeriac is closely related to celery even though it looks nothing like it. That means, Celeriac has been grown as an edible plant for thousands of years. 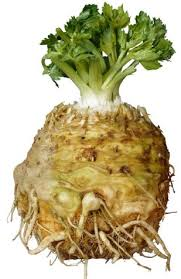 But it wasn’t until the Middle Ages that celeriac became an important vegetable . From that time on, it spread from the Mediterranean, finding its way into Northern European cuisine. Celeriac looks like it might be the root of something, but it actually is the swollen stem. The usual size you see in the supermarket is roughly 10cm, a very pale brown, rough, almost acne’ed looking ball with lime green tops. The green tops look a bit like celery, and the smell is similar but a bit stronger. The thick, rough brownish skin covers a creamy white, crisp inside that’s slightly hotter tasting than celery. Celeriac also grows more easily and keeps longer than celery, making it an excellent winter vegetable. You also don’t have to do any of that blanching the stems as they’re growing like you do with celery. In sub-tropical areas you can sow the seed in March, April and August. In arid areas, you’ll have to wait until next Spring and in most other regions of Australia, you can sow the seed in Spring, Summer and Autumn, except for the tropics. It’s not really suited to that region. But should you be listening somewhere in tropical Qld, and have grown Celeriac, please drop us a line about your success. Celeriac is best planted at soil temperatures between 8°C and 21°C. Hot summers won’t suit this plant. Wait until this hot weather takes a break or start the seeds off in punnets. Tip:Celeriac seeds are a bit hard to germinate, but if you soak the seeds in a saucer of water with a splash of seaweed solution, this will help the germination rate. Like a lot of members of the Celery family, Celeriac likes soil that has plenty of organic compost and manures, otherwise, it’ll bolt to seed. If you start your Celeriac seed in punnets, you can control the moisture content of the mix more easily rather than in the garden bed. Transplant when there’s at least 4 leaves. Celeriac loves wet soil. You can’t water it too much, and a thick layer of mulch will help in keeping the soil moist. If you don’t water it enough you might get hollow roots or the plant will bolt to seed. Keep the weeds down as well because celeriac doesn’t compete well with weeds, but don’t disturb its shallow roots. As the root develops, snip off side roots and hill the soil over the developing root. Side dressing periodically during the growing season with an organic fertilizer high in nitrogen, like chook poo, is also helpful, but don't overdo it, otherwise you’ll get lots of leaf, rather than root, growth. slow-growing, taking around seven months from seed to maturity (that is, about four months from transplanting), although the root is edible at any earlier stage. And again, some say celeriac is frost-tender, while others say a few light frosts won't bother it. I’ve heard that "celeriac increases in flavour after the first frost. You can leave them in the ground over-winter, harvesting as you need them..
One other thing, some recommend drawing soil up around the stems in early autumn, to blanch them; but that’s entirely up to you and I tend not to bother. When it grows, the swollen Celeriac stem tends to push itself out of the soil, sitting just a few centimetres of soil level. If it doesn’t do that for you, you might have to give it a helping hand, and scrape away some of the soil towards the end of the growing season. 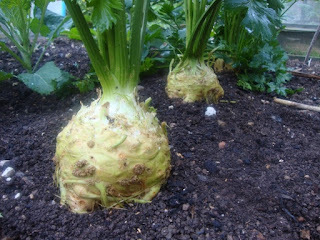 Apart from the long growing season, pests don’t seem to like Celeriac, so a bonus. What do you do with this vegetable? Whatever you do with potato you can do with celeriac. You can also eat it raw. –can grate it or cut it into thin strips or cubes, and to serve it as a salad seasoned with a dressing. Celeriac can also be cooked, either on its own or together with other vegetables. 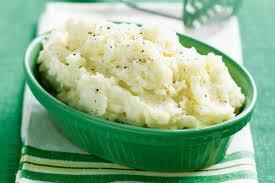 It makes a good puree mixed with potatoes, but best of all, it makes a non-starch substitute for tatoes. Raw celeriac is an excellent source of potassium and a good source of vitamin C, phosphorus, vitamin B6, magnesium and iron. Cooked celeriac is a good source of potassium and contains vitamin C, phosphorus, vitamin B6, and magnesium. Do you need a fast growing tree or large shrub but not a Grevillea and it needs to be a native so it’ll attract local native birds? If you do, then you can’t go past this one then because it’s a robust native tree, it’s only partially deciduous and has spectacular red flowers from early summer through to autumn. This tree grows to around 10 metres plus in the home garden. In a "good year" the Illawarra flame tree is arguably the most spectacular of all Australia's native trees. Flowering is usually in late spring where the tree drops its leaves first. This tree has large seed pods which if you’re a keen propagator, you can easily germinate the seeds. Bear in mind though that flowering may take around 5-8 years from seed. This tree is a food plant for the larval stages of the Pencilled Blue, Helenita Blue, Common Aeroplane and Tailed Emperor Butterflies.